A Bronx, New York man with a longtime interest in African-American history recently purchased an intriguing document at a flea market that he believes to be a “freedom paper” for an African-American man named John Jubilee Jackson. 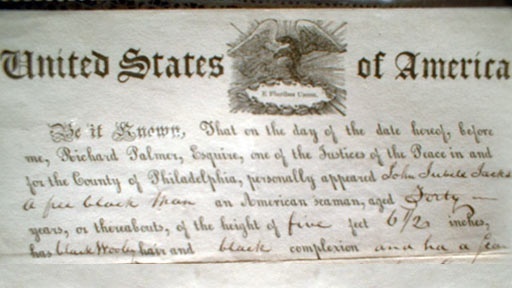 The paper was issued in Philadelphia in 1821, and indicates that Jackson was from Virginia, a state where, by 1780, nearly half of all slaves resided. History Detectives heads to Philadelphia, Mystic, CT and New York City to investigate the document and the life of John Jubilee Jackson, uncovering the remarkable and contradictory reality of free blacks struggling to get by in a racist society. Related Investigation Clara Barton Letter What does this letter reveal about America's early efforts to honor its war dead? Related Investigation Lincoln Forgery Could this piece of sheet music have come from Abraham Lincoln's private collection? Also with Tukufu Zuberi Whaling Ship Might a ship docked in Mystic Seaport, hold secrets to the Underground Railroad? Also with Tukufu Zuberi Birthplace Of Hip Hop Did this Bronx apartment building give birth to a culture that now spans the globe? Also with Tukufu Zuberi Florida Map How did this faded map help unlock the riches of the New World? Also in Season 4 Lindbergh Engine Could a 24-year-old have single-handedly built the engine for Lindbergh's plane?